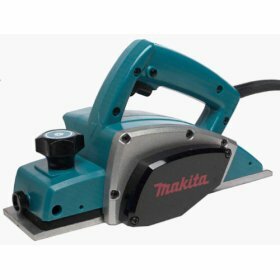 I bought my Makita 3-1/2" planer (N1900B) on ebay. There is something to be said for having the right tool for the job. I had a few doors to plane and this worked great. I also had 400-500 feet of 3/4" MDF that had a rough edge from the table saw. Sanding them was taking too long so I tried the planer, set just deep enough to take the saw marks off. After the planer I only had to run the sander down them once to get a nice edge. The plastic case is supposed to hold the guide in the lid. It only stays in the lid long enough to shut it.